An 84 year old gentleman presents with aortic stenosis. During his work-up, an incidental right upper lung nodule is discovered. Wedge resection of the nodule shows a firm, gray, well-circumscribed lesion. Histologic sections show amorphous eosinophilic material with focal ossification and scattered multinucleated giant cells. A scant lymphoplasmacytic infiltrate is present at the periphery of the nodule. 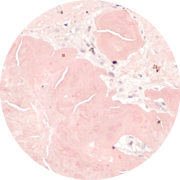 The surrounding pulmonary parenchyma, including blood vessels is unremarkable. Congo red stain is positive. The lesion is diagnosed as nodular parenchymal amyloidosis (nodular amyloidoma).